THIS is how you license Mario out. Those who lived through the ’90s may remember the glut of typing tutorial programs that filled software store shelves. Mavis Beacon ruled the roost with her legion of titles for all skill levels, but there was plenty of room for any company who had a half-cute character in their roster to ante up with a title of their own. So in a way, the landscape was similar to the ‘electronic card/board game’ arena that we looked at last week; all it takes is the right skin to make a title sell. 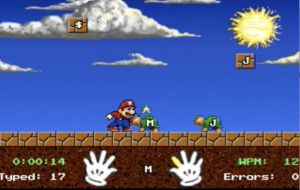 Mario’s entry into the typing game….game…is a pretty remarkable pair of titles that again go way beyond what was necessary, and the result is a very unique experience. Remarkable and unique, but I can’t really say good. 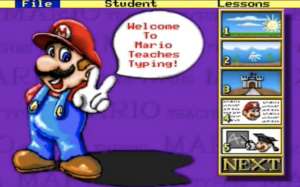 Mario Teaches Typing was developed by Interplay and published by Nintendo itself in 1992. 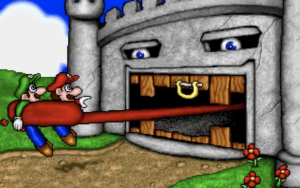 Charles Martinet wasn’t on board yet to provide the definitive voice of Mario, so Mario’s voice is deeper with a more insulting Italian accent. 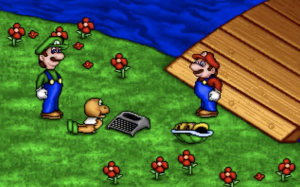 Unlike Mario’s Game Gallery, Mario Teaches Typing has an actual storyline: Mario and Luigi find a magical typewriter that has the ability to destroy Bowser’s castle if the spell is typed correctly. Unfortunately, Mario’s an awful typist. The typewriter then explodes into three pieces (?) and the point of the game is to complete three objective levels (that involve typing) to assemble the typewriter and then use your newfound typing ability to destroy Bowser’s castle. It’s important to note that Bowser has done nothing wrong in this game. Peach and the rest of the Mushroom Kingdom are fine, as far as we know. So this is just a pre-emptive strike. 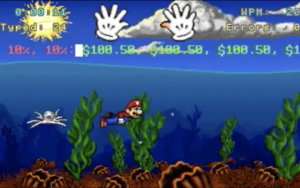 The three levels are what you’d expect from a side-scrolling Mario game in the visual sense, but in order to progress and succeed you need to type the prompted text and numbers correctly. Once that’s completed, the typewriter is assembled and Mario bangs out a flawless line of text that summons a block to fall on Bowser’s castle. 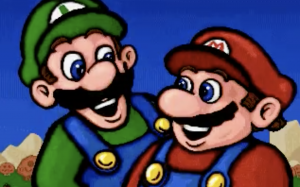 And the game ends on the best shot of Mario and Luigi I’ve ever seen. Pretty unique, right? 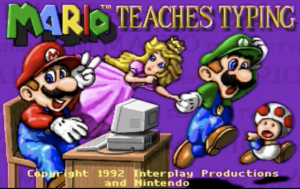 Well, Interplay one-upped themselves in 1996 with Mario Teaches Typing 2, a sequel that replicates the premise of the original and adds a fresh layer of polish, the inclusion of Peach and Toad, calls in Charles Martinet to voice, and introduces a terrifying disembodied Mario head. 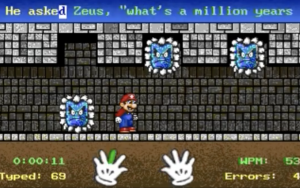 The storyline’s mostly the same; Mario and Luigi find magic typewriter, Mario stinks at typing, typewriter explodes, they go through challenges and win the day. 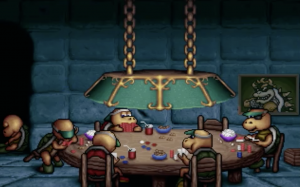 The plot’s a little more involved – there are a bunch of Koopa henchmen, the castle swallows Mario and Luigi and they’re forced to escape, stuff like that – and a lot of that deeper story is told via cutscene, which is a really nice touch and speaks to the ‘more than necessary’ approach to developing this game. And, like I said, the day is saved, this time with a huge typewriter crashing into Bowser’s castle. Who did nothing wrong. But seriously, this disembodied head. 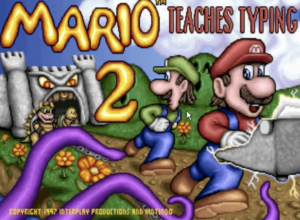 Here’s a playthrough of Mario Teaches Typing 2.